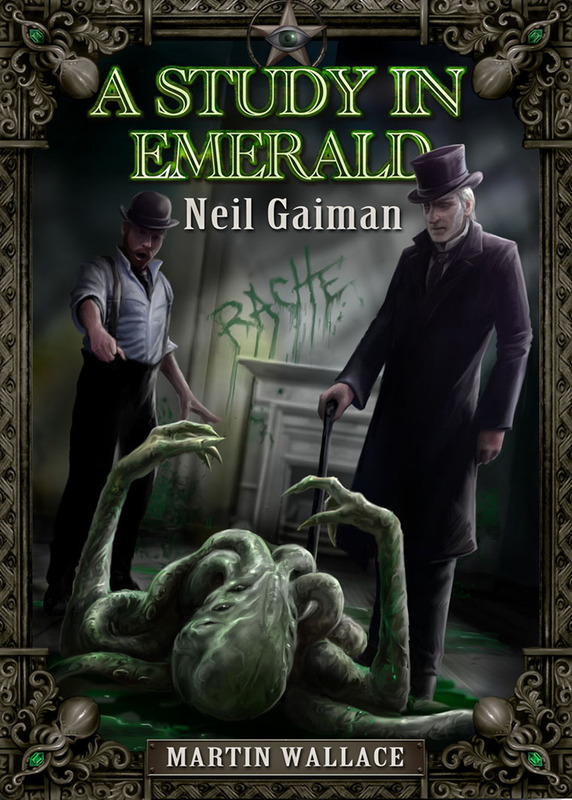 A Study in Emerald is Martin Wallace’s 2013 entry into both the H.P. 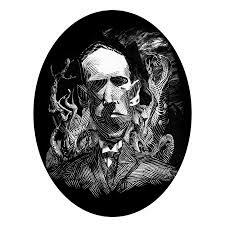 Lovecraft and Sherlock Holmes genes. It’s a game that will remind players of Arkham Horror in many ways, but without that game’s overwhelming confusion. That is, in A Study in Emerald you can create a plan and actually work towards its fulfillment. Basically, what we have here is a solid game for 2 to 5 players, which will produce an evening’s worth of entertainment for those people lucky enough to get their hands on a copy (I believe it’s out of print right now). 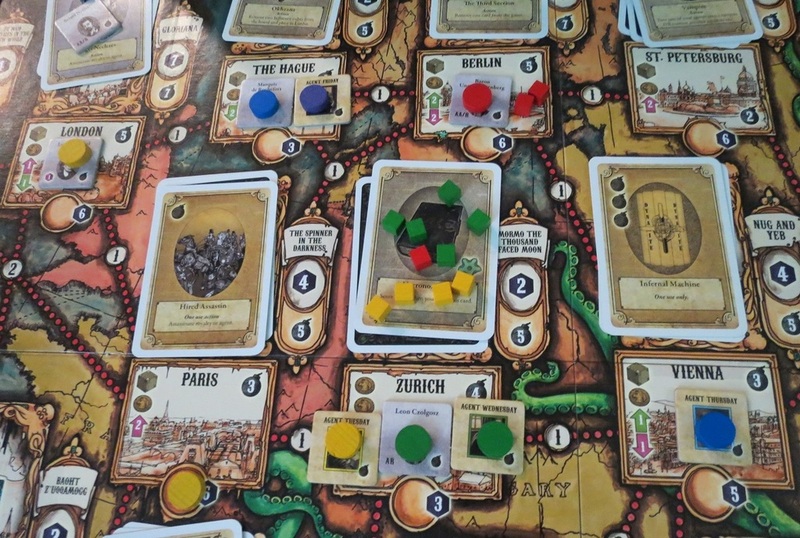 A Study in Emerald is an ingenious combination of a deck building and puzzle solving game based on a map of 1890’s Europe. (Though the map is a bit dark and cramped for my tastes, it does help convey the game’s strong Lovcraftian feel). In the game, itself, each player control a main agent, code-named after a day of the week, and as many minions as they have the time and resources to recruit. Most of these minor agents are actual anarchists or revolutionaries of the period, with a few fictional characters, such as Irene Adler, thrown in. Each agent, in turn, is rated for their bomb throwing ability, which counter-intuitively can apparently also be used to save a member of the royal family (depending on which faction the player belongs to – more on that later). 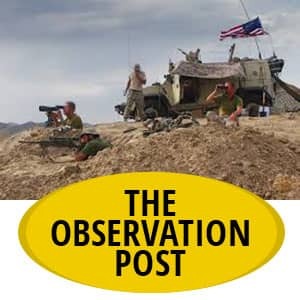 These factions, in turn, are either trying to start a war, in order to distract the population from the Old Ones, who actually control society (the Royalist faction) or start a revolution, in order to put humanity back in control of its destiny (the Restorationists faction). Of course, each European city comes with its own pile of random event cards and one member of the royal family. Player’s agents may try to take control of the city in order to earn some cheap and temporary Victory Points or they can assassinate (or hide) the royal living there (depending on which secret faction they belong to), or they can travel to other cities or they can block an opponent’s actions. In order to expand their own deck players may bid on the random events showing on the board by placing one or more influence cubes on them. Once someone wins the card bidding war they take control of the card, place it in their discard pile and move any influence cubes there to the “Limbo” box. 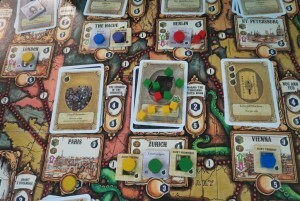 During a later turn players may then move their influence cubes out of Limbo and back under their control by paying gold for them. Center: A “Study in Emerald” city pile with various player’s influence cubes on them. Players are in a bidding war to control the top card in this pile. Although there really aren’t any gold coins in this game. Players pay for new influence cubes or move old cubes out of Limbo by playing cards that are worth one or two gold coins each. Of course, cards that are used to pay for influence cubes can’t be used for their random event or their bomb throwing ability etc. So besides being an above average hand management game A Study of Emerald is also a conflict game and an economic game all in one. Plus, it has plenty of player interactions to boot. But it’s not perfect. Fortunately, most of its glitches are fixable and therefore of a minor nature. Basically, its two most obvious problems have to do with the game’s factions and its Holmesian theme. First, as I’ve mentioned, each player secretly belongs to one of the two factions: the “Loyalist” and the “Restorationists.” I suppose this was deemed necessary to add some meat to the Holmesian theme, seeing that the only other aspects of the game having anything to do with Sherlock Holmes are the few cards involving Holmes, Watson, Professor Moriarty and Irene Adler. 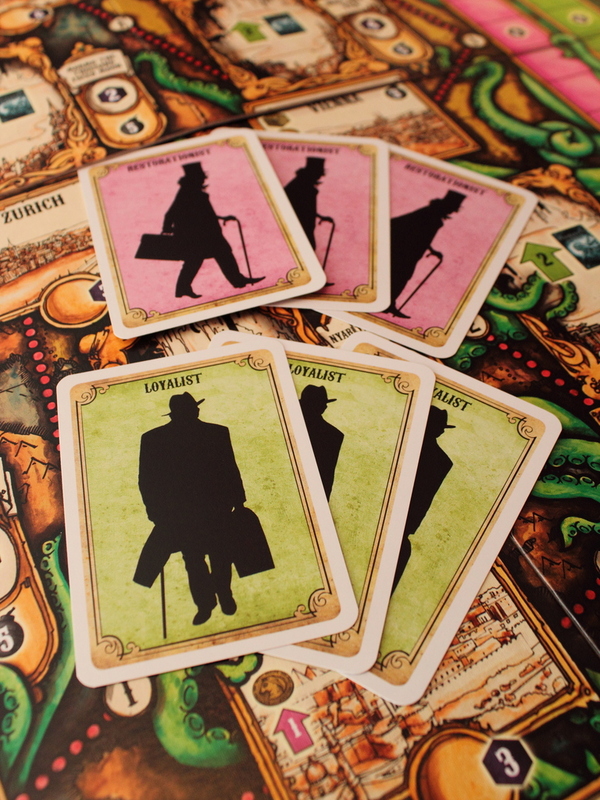 But as these character cards are essentially no different than any of the others, the entire Holmes “mystery” theme rides on the ability of players to “solve” the mystery of which player belongs to which faction. 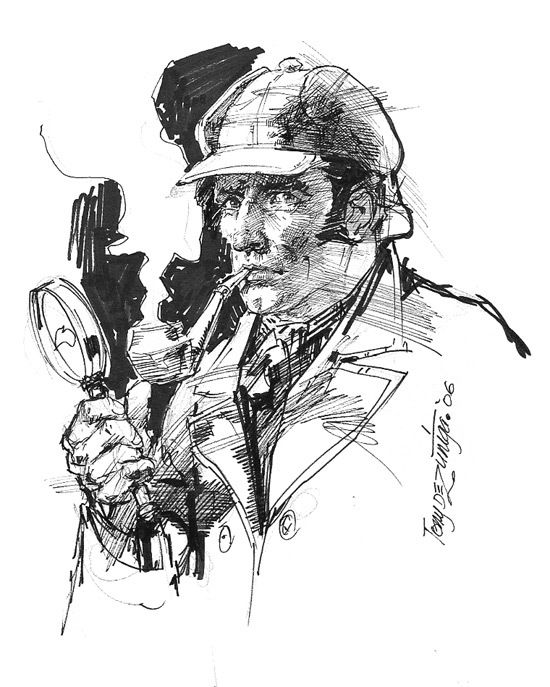 Unfortunately, this is a “mystery” that couldn’t stump Inspector Lestrade, much less Dr. Watson or Sherlock Holmes. That is, anyone who stayed awake for the last three quarters of any game is more than likely to be aware of each player’s faction. After all, the best way to earn permanent Victory Points is faction specific: Royalist hide Royals and Restorationist assassinate Royals. Now, in theory, a particularly clever player might assassinate or save a minor royal early in the game only for the purpose of throwing his opponents off the scent, but by the time such things matter each player’s faction is pretty obvious. Second, A Study In Emerald, has a very clever game mechanic involving the player with the least Victory Points. Simply put he loses the game for his fellow conspirators. Now, while this mechanic is undoubtedly clever, it can turn out to be too clever by half when it occasionally generates mighty strange outcomes. For instance, the game can hold up to 5 players. So that sometimes breaks down into a game that pits 2 players in one faction against 1 in the other or 3 players against 1, or basically some combination with a single player in a faction. In these cases, that player finds himself playing by a different and less stringent set of rules halfway through the game. To be specific, in our last game there were 3 players. I was tied for first place, one VP short of the finish line. But I also had a partner who was dead last. Now, remember, I was in first place. But due to the game’s unusual rules regarding last place finishers, it was just about impossible for me to win! That is, if the player I was tied with cross the finish line first, he naturally would win (as he had no partner to worry about). And if somehow the dead last player overcame both of us with a late game surge, he would win, which is no more than what you would expect. But as I would lose if I crossed the finish line first (because my partner had the lowest score), how was I going to win? Someone had to cross the finish line and whoever it was I’d lose. My only hope was to fine a card that allowed me to change sides and then cross the finish line first and hope my new partner was not last. But there is only one card that allows a player to change sides and it is just about impossible to find when you need it (it turned out to be the last card that would have become available). So although I was leading, I couldn’t win. Now, some people say this is simply part of the game’s landscape. Just something you have to overcome in order to win and every player has an equal chance to be helped or hurt by this feature. On the other hand, I think having a player’s job become harder or easier after the game begins due to a random action is not the best way to handle the situation. Yes, there are good games with asymmetrical rules, such as Here I Stand, but players know the rules landscape BEFORE the game begins, not once they’ve spent 45 minutes doing their best to come in first. As for how this matter can be fixed, of course, players are free to somehow ensure that there are at least 2 members in each faction or they can drop the rule entirely or they might just ignore the whole issue. So, in fact, this is an annoying but essentially a minor matter. However, of more concern to me, at least, was the fact that the rules to the game were not always of the clearest nature. For example, if you were a Restorationist you would want to assassinate Royals. 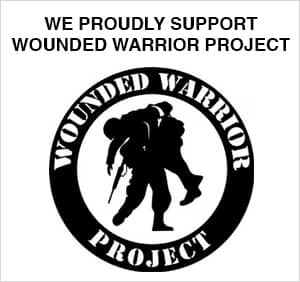 You would do this by having an agent capable of assassinating a member of the Royal family (marked with a “AR” – Assassinate Royalty – as opposed to agents who could only Assassinate other Agents – marked “AA”) and supply him with enough bombs to do the job. But how do you hide (that is, save) a member of the Royal family if you are a Royalist? Why, according to the rules you simply “do the opposite.” But what exactly is the “opposite” of a multi-step set of directions? Is it that AR agents can now save royalty or does it mean that “AA” agents can save Royalty? (“AA” agents being the opposite of “AR agents.”) We played that “the opposite” means that the agents capable of assassinating royalty are also capable of saving them. But why have the confusion in the first place? But the bottom line on this game is that it is fun and I’d play it again if asked. I might even request it, which is really the measure of any game after all. So A Study in Emerald is definitely a solid design that anyone who likes such things should try.